Email me or hit me up through social media and I’ll make sure I help you out. Look for live Q&A sessions and call-ins. 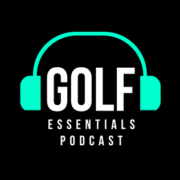 Subscribe on your favorite podcast platform to get Golf Essentials every day. Here’s your hour of practice broken down for you. We’re starting off on the range with a great drill to help your arms stay connected with your body as you rotate. We run into a lot of problems when we lift our arms away from the body during the swing. Start off with some short swings with a towel stretched across your chest, held under both arms. Try to make small 9:00 swings without losing either end of the towel in the backswing or the follow through. This drill does a great job of giving you the feeling of staying connected. Do the drill at home in your spare time as well. Next, we’re going to experiment with hitting shots of different trajectories. Use an alignment stick on the range to ensure that we’re aiming in the exact direction that we think we’re aiming. Always be very diligent with your setup and club face. 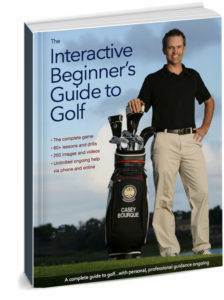 Start with your sand wedge and hit a normal shot at the target. Next, with the same club, try to hit one low at the target. Then, hit one high. Do this for each club in your bag…or skip clubs if you prefer. Try to notice what your tendencies are. Perhaps when you try to hit the high shot, the ball tends to hook…or when you hit the low one, it tends to go out to the right. This is really helpful information when you get onto the golf course. When there’s trouble left, you can use the shot that you know won’t hook the ball. Then we’re heading over to the bunker to work on the standard bunker shot for 10 minutes. Lay the club open so that the grooves are pointed at your left toe. Simple 9:00 swings will do the trick. Finishing on the putting green, use your alignment stick with a perfectly straight 4-5 foot putt. With the help for alignment, make sure that your putter face is square to the target, as well as all your body lines and shoulders. 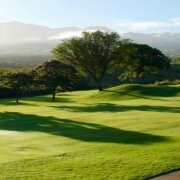 Make smooth strokes, trying to hole 25 consecutively…or pick a number in line with your experience level.